In July 2015, a key cryogenic facility at Fermilab was shut down, leaving the laboratory’s Mu2e experiment without a space to test its superconducting magnets. Luckily, in the search for new physics at Fermilab, it’s “waste not, want not”: A new cryogenic testing facility for Mu2e now lives in a space occupied by a previous experiment, called CDF, and is even created with refurbished parts from past experiments, including CDF. 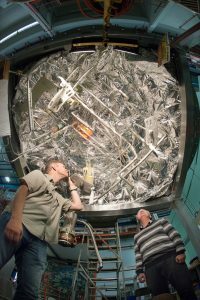 The Mu2e experiment aims to capture a hypothesized phenomenon that has never been observed: a particle called a muon converting directly into an electron. If scientists were to witness this rare event, it could signal that there are other, hidden particles in the universe yet to be discovered. The Mu2e experiment is specifically designed to achieve this unmatched sensitivity. Comprising three superconducting magnet sections, it stretches nearly the length of a lap pool — about 75 feet. 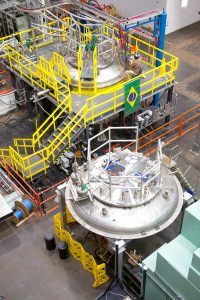 The experiment’s most distinctive feature is its S-shaped central section, called a transport solenoid, which contains 52 coils of superconducting wire that act as magnets. Manufacturers in Italy will wind each coil and place them into 14 sections, which will be assembled at Fermilab to create the solenoid’s serpentine shape. But before the solenoid can be put together, each section of the magnet needs to be tested to make sure it works under the ultracold conditions necessary for superconductivity. “Imagine you build the magnet, transport it into the building and put it in place. And then you turn it on and the magnets don’t work. It would be very risky,” Lamm said. To eliminate this possibility, the 14 solenoid sections, each containing between two and five coils, will be sent to Mu2e’s new cryogenic testing facility before assembly. The magnet vendor will have already tested the magnets at room temperature to check for electrical issues such as short circuits, but at Fermilab’s cryogenic testing facility, the sections will really be put through their paces. To reach frigid 5 Kelvin (that’s about minus 451 degrees Fahrenheit, a few degrees warmer than outer space), the magnet sections are suspended in a cryostat, which Hocker called “a glorified thermos.” Inside the cryostat, the magnet is isolated from the warmth of the outside world, allowing the section to be slowly cooled with liquid helium, a process that takes about a week. And then comes the real test: running an electrical current through the coils that’s 20 percent higher than the one that will be used once Mu2e is online. “You want to make sure these magnets can go up to well beyond the current they’ll need to operate at during the experiment and still stay nice and cold to keep them from transitioning to a normal conductor,” Hocker said. Each solenoid section will take four to six weeks to test, including the gradual cooling and an equally slow warming period. The first section will arrive this fall, beginning a nearly two-year testing process that should be complete by 2019. 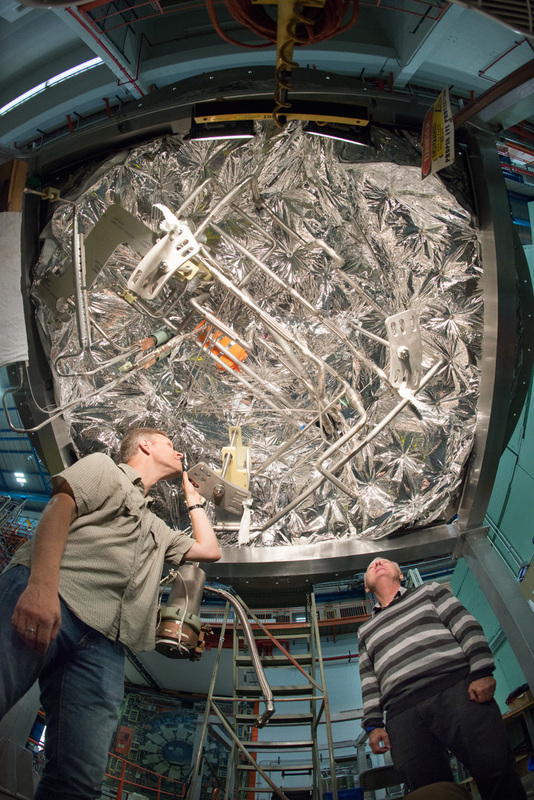 Once the transport solenoid has been tested, constructed and joined with two other sections to make up the Mu2e detector, the experiment will begin a three-year run in search of physics beyond the Standard Model.